All mutual funds have two plans – Regular and Direct. Direct plans give higher returns every year because investors do not have to pay commissions. Despite this, nearly 90% of retail investors invest in Regular plan mainly due to lack of awareness. Investors can now transact in Direct plans through platforms such as ORO. 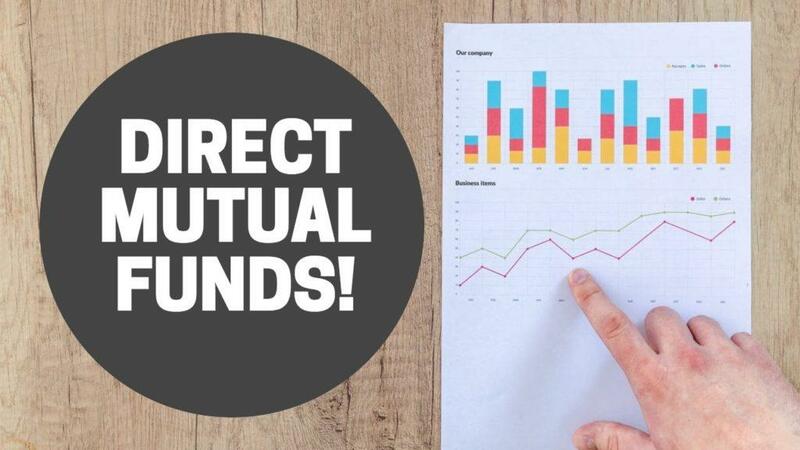 What are direct plans in Mutual funds? In 2013, SEBI announced that every mutual fund scheme will need to have two plans. One would be the regular plan which had existed till date. In addition, mutual funds had to introduce a direct plan of the same scheme which would be similar to the regular plan in all respects but would have a lower expense ratio (i.e. fees you pay the mutual fund). This is because when you invest in the direct plan, there is no distributor involved and the commissions that mutual funds have to pay distributors to go away. Paying lower fees on exactly the same fund directly translates into higher returns for investors. 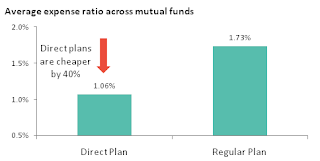 The difference between the expense ratio of regular and direct plans can be as high as 2% for some mutual funds (Figure 1). On average, direct plans are 0.66% cheaper than the corresponding regular plans – that is a discount of nearly 40%! Figure 1: Direct and Regular expense ratios for a selection of mutual funds. Does the difference in expense ratio matter? As an example, suppose you had invested Rs. 10 lakhs at the beginning of the period in a fund in which the direct plan has an expense ratio of 1% and the regular plan has an expense ratio of 2%. Further, assume that the fund earns a conservative return of 10% before costs. Then at the end of 10 years, the difference in your earnings between the two plans will be Rs. 2.1 lakhs. or more than one-fifth of your initial investment corpus. After 20 years, with the compounding, the difference will be a massive Rs. 9.5 lakh or nearly your entire initial investment corpus! Now you may not be invested in the same fund for that long but as long as you plan to be a mutual fund investor for some time, these numbers can’t be ignored. This can be gauged from the fact that the smart money investors in India (i.e. large institutions, corporates, and similar professional investors) have already migrated almost completely to direct investing. After just 2 years of introduction, 70% of smart money investments happen in direct plans. Maybe I am already buying direct plans? Unlikely. 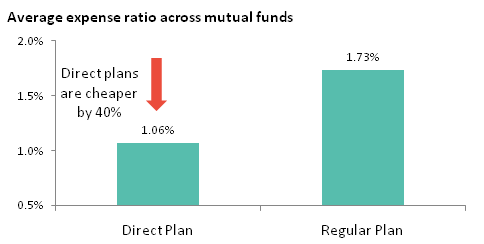 Only 10% of retail investors have invested through direct plans. There are a number of reasons for this. First and foremost is the lack of awareness among retail investors about direct plans. This has to do in large part with the fact that the distributors, who are closest to investors, have no incentive to promote direct plans. In fact, many of them market their services as “free” to the client, conveniently overlooking the fact that they get paid every year from the investor’s money, even though it is via the mutual fund. A second reason is that so far it has been difficult for retail investors to invest in direct plans. The main way of doing this has been by maintaining separate accounts with each mutual fund company which is cumbersome. Finally, many retail investors are also scared away from direct investing by distributors and platforms which claim to offer expert advice that investors will miss out on if they go direct. Professional financial advice is important and can make a big difference to returns but the important question to ask is – Is commission-based model the best way to get investment advice? Mis-selling i.e. selling investors the highest commission products is the biggest flaw in this model. The second question is whether that advice should actually cost 2% per year. Instead by going direct, investors can use just a part of the saved commissions to hire an unbiased, fee-based advisor whose incentives will be aligned with their own. Investing in India is all set to change with ORO (www.orowealth.com) – India’s first direct funds’ platform. For the first time, ever retail investors can transact in direct plans with the same convenience and level of service as standard plans. For investors looking to further enhance returns with financial advice, ORO also has an online fee-based advisory platform. Invest with ORO and experience the difference that truly low cost investing and unbiased, good quality advice can make to your returns. Ohh! Your Table 1 has hit the nail on the head. I am 27 years old, if I choose direct plan for next 30 years different would be 32 Lacs. Yes Rutvij. For young people like yourself who will stay invested for a long time the loss from regular plans/benefit from direct plans is even greater. If you are already invested in MFs, then you can now actually see the amount of commissions you are paying. From 1st Oct 2016 onwards, this info will be revelaed in your consolidated account statement. Plz let me know the fees you charge for transacting ?. Are there any hidden charges? Assume if we invest Rs 5000 and after one month it grows to Rs 6000 then how much you charge while redemption of Rs 6000? And how much time it will take to redem? Hi Shubham, You can check our pricing plan in detail here: https://orowealth.com/plans. There are no charges besides these. To your specific query at the time of redemption, we charge a one time convenience fee. This will be Rs 50 if redeemed amount is under Rs 1lakh and 0.1% of the redeemed amount for amounts > 1lakh. Time taken for redemption is exactly in line with industry standards – for debt funds you will receive the redeemed amount in your bank on t+1, if request is submitted before noon. For equity, it is t+3. Hi Shubham, There is a big difference between the convenience fee charged by ORO and the commissions that you have to pay in regular funds. For a lumpsum investment, consider the table we have provided in the blog. Suppose the investor invests for 5 years, then based on the assumptions above, they would have lost Rs 69,296 due to commissions. In contrast, if they had bought a direct plan through ORO, it would cost them Rs 1000 at the time of purchase and Rs 1540 at the time of redemption, So Rs 2540 in total. Rs 2540 vs. Rs 69,296 is a very big difference! The case for SIP investor is similar. Consider the SIP example in this blog:http://blog.orowealth.com/2016/02/sip-calculator-calculate-your-savings.html. Over 5 years, SIP investor has to pay Rs 1000 to ORO vs. losing Rs 38,946 to commissions. Hope this answers your query. According to information given on your website there is 0.75% p.a. Extra Earning in comparison with regular plan and i am planning to invest Rs 10,000 amount in mutual fund ,so according to your calculation I will save Rs 284 in three years in comparison to regular plan .But you are charging Rs 200 (for SIP) + Rs 50 (buying) + Rs 50 (redeem) = Rs 300.Then why should i go for this , i can directly invest with AMC or Camsonline or MFutility. If you are going to invest Rs 10,000 lumpsum and keep it for 3 years: ORO fees would be Rs 100 (50 for purchase and 50 for redemption) vs. Commissions in regular plan of Rs 225 (assuming 0.75% p.a. as commissions and assuming 0% return on the fund. Please note commissions will be higher if the return is positive). Do you have annual charges to maintain an account with you ?? Can we convert our existing regular. Funds into direct funds using orowealth. Hi Govind, With ORO, you can do a SIP in direct plans of any mutual fund/AMC supported by us. In case you would like to know ORO charges for SIP, you can check those here: https://orowealth.com/plans. As a comparison, you can check the amount of commissions that you can save when you opt for a direct SIP vs regular SIP in this blog post:http://blog.orowealth.com/2016/02/sip-calculator-calculate-your-savings.html. Please let me know if you have any further clarifications. My family (Self, wife & son) has invested >Rs 5.00 lacs in MF. we also have two SIP accounts. Planning to invest 1-2 lacs in a months time. My Questions are: a)Can we maintain all existing Mf accounts thru you. b) For Future investments(long term 5-10 years) in MF does ORO assist in selecting correct MF. We have existing MF & SIP, can we map them to ORO, if yes how and what's our benefit. For further investments will ORO assist us in selecting the correct MF for 5-10years term window.